Looking back, I'm not too happy with this page. 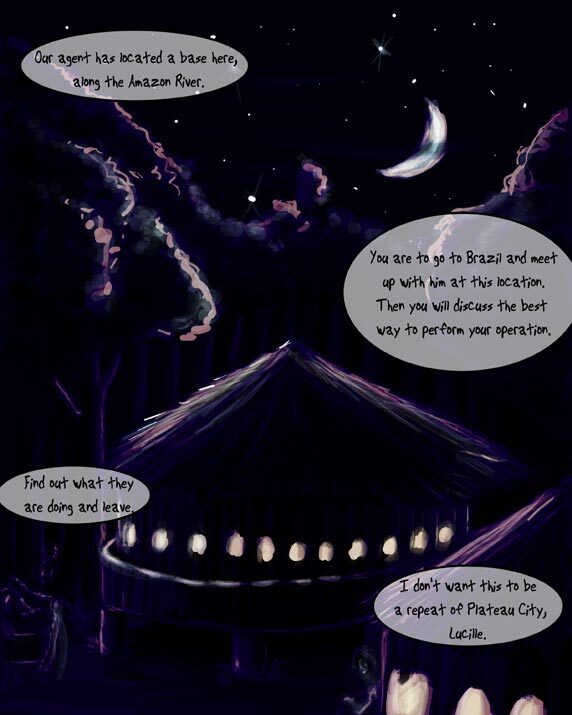 I was really proud of it before, because it was the first night scene I did that actually LOOKED LIKE NIGHT. Now, however, it looks very, very messy. I guess I SHOULD still be proud of it, but...blech. I do still like the sky, so that's a good point. I really hope things are making sense so far. I realize the beginning of this chapter is going by on fast-forward. That is intentional. I could not think of anything interesting enough to fill up the time between the Hospital (end of Chap. 1) and the Boat, so I cut it out. I also couldn't think of anything interesting enough to fill up the trip between the Boat and Base Camp. This is because the interesting stuff is up ahead and I didn't want to spend a month slogging through the Amazon in the daylight when I can BARELY do the Amazon at night--Large areas of black are my friend. Also...I've got I-wanna-get-to-the-story-itis, and the previous few pages were setup. Hopefully rational set-up, though it should be kinda self evidant--mission, jungle, Lucy getting armed, Mir getting armed. Something tells me the immedate future involves lots of guns and dead people. Although I have been thoroughly creeped out by the "Action" part of this chapter, and REALLY hope that the creepy factor is just me. I did not know that this was how far "Out there" the story was going to get. I swear. On a stack of bibles. Just don't ask how I can write it and not know, and just trust me that I don't. I don't want to take it back, because that would hurt the story, but I don't ever, ever want to look at it again. NEWS: YOU. GUYS. TOTALLY. ROCK. This has been the best month EVER for voting...the numbers just keep rolling off the counter, man. I think I'm gonna make a reward for ya'll if we hit 150 on TWC before the end of the month. That would be MAJORLY cool if we did that. Gotta think of a wallpaper to do. And I'd just like to say...Forum. Forum forum forum forum. Gp. Use. Visit. Sign up--they won't bite or send you junk mail--and play. Please?